Continental recently submitted a media release on the increasingly difficult coding on tyre sidewalls, and the fact that for consumers it is mostly unintelligible. But we wondered if aftermarket and repairer staff are as clued up on the tyre sidewall information as they should be. These sequences of numbers, letters and in some cases symbols help motorists and the sector to identify the right tyre for a particular vehicle - an important consideration in order to achieve the best balance of tyre performance for acceleration, braking and cornering, as well as ride comfort, noise and rolling resistance. Here's an example of a sequence you may find on the sidewall of a Continental tyre, and how to decode it. In the case of "225/45 R 18 95 H SSR MOE", the number "225" represents the width of the tyre in millimeters - so in this case the tyre is 225 mm wide. 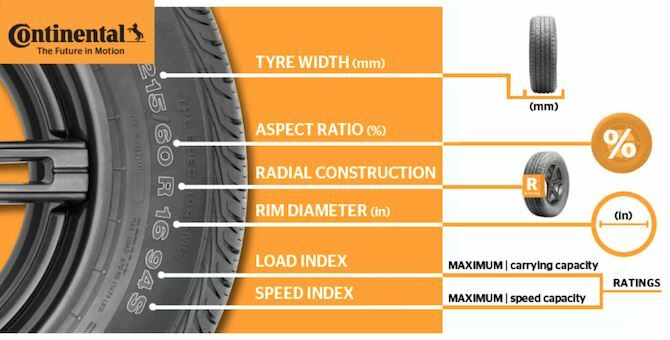 The "45" that follows is the aspect ratio - the height of the tyre sidewall as a percentage of its width, which equates to 101 mm for this tyre. Next up is an "R", which is short for "radial". Today, radial tyres have almost completely replaced the cross-ply tyres that were the standard design until the 1980s. The figure "18" indicates the wheel rim diameter in inches, while "95" is the load index, indicating the maximum weight the tyre can bear. In this example, the tyre is rated for 650 kg. Then comes the letter "H" which is the speed index, where "H" signals a maximum speed of 210 km/h. "SSR" indicates that this is a Continental "SelfSupportingRunflat" tyre, otherwise identified by "RF" or "Runflat". The abbreviation "MOE" tells us this is a Mercedes-Benz original equipment tyre with run-flat properties (E = extended mobility). The number of these manufacturer-specific codes is set to increase even further in years to come, as more and more automakers submit their own specifications to leading tyre manufacturers. High-performance tyres often include "XL" after the size marking, or the word "Reinforced" on the sidewall. This refers to tyres with additional sidewall reinforcements, which are designed to cope with the additional forces created by high-speed driving, cornering and braking. "FR" is used on tyres with a flange rib, which incorporates additional rim protection features. In the case of 4x4 tyres, "M+S" is short for "mud and snow", referring to tyres that are suited to operating in adverse conditions. Specialised winter tyres for passenger cars, which feature a snowflake icon, are not sold in South Africa due to construction and compounds which are not appropriate for our climate. Along with this data, the tyre sidewall carries lots of other information, too. One important item for drivers is the production date, indicated by what's called the DOT code. It's made up of the letters DOT and two pairs of figures, separated by a forward slash. The first two numbers show the week the tyre was built; the last two indicate the year. So "36/16" means the tyre was built in the 36th calendar week (i.e. between September 5 and 11) in 2016. This is important in order to determine the age of the tyre, as the rubber degrades over time. Tyres older than five years should be avoided in the interests of safety and reliable performance, and this can be further influenced by the manner and environment in which tyres are stored. Now - why not test your staff and see if their knowledge is up to scratch.